On Friday, American Tower Corporation (ATC) threw the switch on its recently completed distributed antenna system (DAS). For several hours, Island residents with AT&T wireless enjoyed a level of service normally only associated with the temporary signal upgrades that went along with presidential vacations. Just as quickly, up-Island wireless users were left muttering, “Can you hear me now?” after power to the system was switched off so ATC could resolve a system glitch. 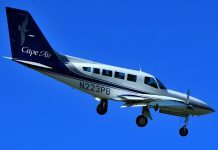 On Wednesday, ATC told The Times that the DAS is up and running throughout the Aquinnah and Chilmark service areas. That was good news to town officials and residents who have labored for six years to improve wireless communication in an area of the Island notorious for its lack of wireless signal strength. “I’m thrilled,” said former Aquinnah selectman Camille Rose, who helped launch the effort six years ago to fend off construction of a large tower. DAS relies on a series of radio access nodes (RAN) connected to small antennas set on telephone poles, or poles erected for that specific purpose, to distribute cellular telephone signals. Although the range is considerably less than with taller towers, the DAS appeals to communities where a high conventional tower is unwelcome and wireless telephone service is poor. There are 11 nodes in Chilmark and four in Aquinnah. Wireless signals are now expected to reach into the formerly dark corners of Moshup Trail and Menemsha. Depending on topography and equipment, a DAS node may have a cellular signal range that extends from one quarter to three quarters of a mile. In April, ATC deployment manager Don Clark told Chilmark selectmen that the company had done all “make ready” work on the utility poles in collaboration with NSTAR, Comcast, and Verizon. He said the fiber network had been attached to almost 700 poles and all 15 nodes had been installed. “We believe with this design that we are going to meet coverage objectives,” Mr. Clark told selectmen. On Wednesday afternoon, Chilmark town administrator Tim Carroll, the most recent point man in the DAS effort, said he was happy to hear that the system was up and operating. “I am hoping that it will allow people to feel more safe on the roads traveling and they will be able to call in for help when they need it, whether at home or on the road,” he said. In past years, poor communication has hindered the response of public safety officials when people were unable to call for help, or had difficulty providing locations, particularly on beaches along the south shore. “Hopefully, it will increase our ability to get to the scene of an emergency quicker because we won’t have the communication issues,” Chilmark police chief Brian Cioffi said. The wireless signal originates from a hub station placed at the Chilmark landfill off Tabor House Road. ATC has a contract to lease space to AT&T and is seeking other wireless carriers. Verizon Wireless has so far indicated that it wants no part of the up-Island DAS. In a phone message left May 9 in response to a letter from a Chilmark resident that was shared with The Times, Rich Enright, a Verizon Wireless official from Westboro, said the company would not join the DAS because the ATC rent was too high, adding, however, that Verizon would be willing to create its own system. “I suggested to Tim years ago, and I would still make the same offer, that I’m willing to go to the town of Chilmark with a map and look for locations for 40- or 50- foot wooden poles that I could put antennas in, that would be less visually obtrusive to the system that’s going in now, and would provide some service, and would also have back-up power, which this thing does not have,” Mr. Enright said. Mr. Carroll said his facts are not quite accurate. “I was not involved in the project four years ago,” he said. Last year, efforts to complete the system hit a snag when ATC and NSTAR were unable to reach an agreement that would allow ATC to use the power company’s utility poles to string the fiber-optic cable that is the backbone of the DAS system. The differences were resolved and the system moved forward. ATC began stringing wire. Where no poles existed, ATC ran the wire underground and erected a pole to mount an antenna. The first transatlantic telephone cable was completed in September 1956. The milestone in telecommunications linked the U.S. and Canada to the United Kingdom and took three years to complete. The effort to improve up-Island wireless service took almost twice as long. Aquinnah launched the effort to create a DAS system in December 2005 as a way to bolster the town’s defense against cell towers and lawsuits brought by cell phone companies under the Telecommunication Act of 1996 (TCA), a federal law that limits the obstacles that towns may place in the way of wireless communication companies seeking to provide service where there is a lack of coverage. In August 2006, representatives of Aquinnah and Chilmark flew to Nantucket for a quick tour of that island’s distributed antenna system. The up-Island officials wanted to see the antennas firsthand as they contemplated how best to provide improved cellular telephone service in their towns. West Tisbury joined Aquinnah and Chilmark in the discussions. But plans for a tri-town agreement were put aside when West Tisbury town officials and residents disagreed about permitting requirements and the extent of the wireless communication benefits the system would provide in a town with existing towers. West Tisbury pulled out. Chilmark and Aquinnah forged ahead. 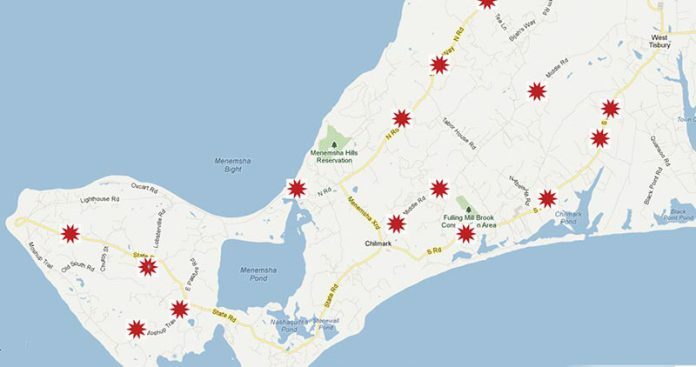 In February 2010, Chilmark and Aquinnah officials signed a contract with ATC to build a DAS that when fully completed could include 55 nodes. The contract called for ATC to pay Chilmark $14,000 in rent annually for hosting the hub station and make payments to the towns of $600 per pole per carrier, dependent on the number of carriers and the minimum number of nodes, or antenna transmitters, used throughout the system. One solution to poor up-Island wireless communication presented itself years ago, but public attitudes concerning cell phones were quite different. In 1999, Chilmark voters supported a request by public safety organizations, including the Coast Guard, to place antennas on Peaked Hill in order to improve radio reception. Due to existing conservation restrictions, placing the antennas required a special act of the state legislature. At the time, voters expressed opposition to allowing cellular companies to share antenna space and language was inserted specifically barring commercial use.